The history of baths in İstanbul dates back to the Roman times and the importance of the concept in Ottoman and Turkish cultures is great. The history of baths in Istanbul dates back to the Roman times and the importance of the concept in Ottoman and Turkish cultures is great. The Roman concept of baths evolved over time and it became a Turkish tradition eventually. If you want to experience this ages old tradition in İstanbul, take a look at our list. It is located in Tophane and was commissioned by Kılıç Ali Pasha to Architect Sinan to be in the service of his conqueror marine forces. It was built between 1578 and 1583 and later became a symbol of Tophane. Its large dome which lets the sunlight in the hamam is the crown of its architecture. The dome is the second largest historical dome in İstanbul. Kılıç Ali Paşa Hamam was restored in 2012 in order to meet the needs of today. There are separate sections for men and women and the hamam rituals last for around one hour, but you can relax inside for as long as you like. There are massage parlors as well as a café to enjoy a drink and a souvenir shop. Çemberlitaş Hamam is located on the Vezir Han side of the Byzantine monument erected by Constantinus I, on Divanyolu – Çemberlitaş. It was commissioned by Nurbanu Sultan, the wife of Selim II and the mother of Murad III. The hamam has two identical sections for men and women. It is one of the late works of Architect Sinan. You can both have private time or ask for traditional massage services and other hamam rituals. Galatasaray hamam was originally built as a part of the Galatasaray Mosque complex in 1481 as commissioned by Sultan Beyazıt II. Among the past guests of the place there are many pashas, qadis and grand viziers. Today you can both enjoy the bath and attend the special entertainment programs organized for groups. Bubble bath, oil massage and other services are available and the hamam is regularly visited by tourists. Located on the Anatolian side of İstanbul, in Üsküdar, Çinili Hamam was commissioned by Kösem Sultan in 1640. The interior area is spacious due to the high domes. The visitors always leave the place happy thanks to the massage and other hamam services. Commissioned in 1741 by Sultan Mahmut I, Cağaloğlu Hamam is close to the Basilica Cistern. 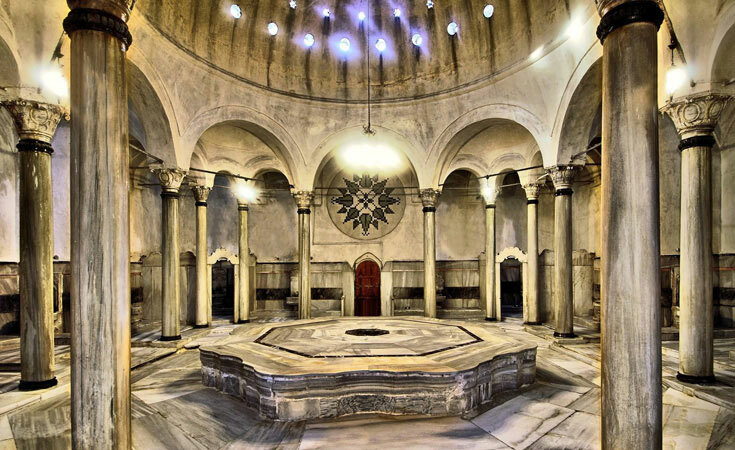 There are separate sections for men and women in this baroque influenced 300 years old hamam. This enchanting structure was included in the New York Times “1000 Places to See before You Die List”.